Starch when used in food, assists with texture, viscosity, gel formation, adhesion, binding, moisture retention and can be used as a fat substitute. 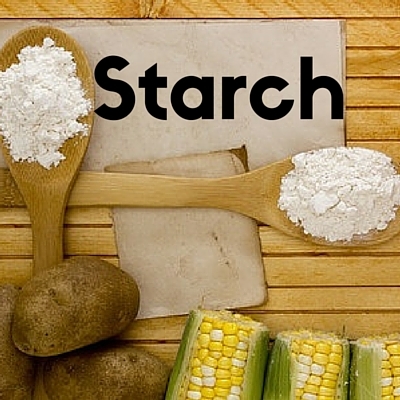 Starch is a carbohydrate found in many plants and is a large part of the human diet. Common sources of starch include corn, wheat, potatoes or tapioca. It is a polysaccharide, with an abundance of glucose molecules. Whether in its original form, or as one of its derivatives, starch has a variety of uses in the food industry, as well in manufacturing. Starch comes from the middle english word “strechen,” meaning “to stiffen.” Yet use of the carbohydrate can be traced back much further. There are some references of ancient Egyptians sticking papyrus together with a starch glue and Romans extracting starch from grain in 170 BC. The first recorded starch discovery was by French chemist Bouillon Lagrange in 1804. A few years later, Russian chemist Gottlieb Kirchhoff found potato starch could produce sugar by an acid hydrolysis. When used in food, starch assists with texture, viscosity, gel formation, adhesion, binding, moisture retention and can be used as a fat substitute. It also works as a emulsifier, stabilizer, and a clouding or glazing agent.4 However, it’s main use in the food industry is a thickening agent. Modified Starch, is native starch that have been modified physically, enzymatically, or chemically. This is done to enhance or diminish specific attributes of starch, specializing the modified starch for thickening, gelling, encapsulating or such. Starch thickens food through gelatinization and retrogradation. Heat causes starch to absorb water and swell, while increasing viscosity and clarity. Once the maximum viscosity is reached, the cells move apart and decrease viscosity. When the product begins to cool again, viscosity increases, making the solution cloudy and eventually forming a gel. The strength of the gel depends on the type of starch and how much is used. 1. BeMiller, James N., and Roy Lester. Whistler. Starch: Chemistry and Technology. London: Academic, 2009. 2. Nuss, Emily T., and Sherry A. Tanumihardjo. “Maize: A Paramount Staple Crop in the Context of Global Nutrition.” Comprehensive Reviews in Food Science and Food Safety 9.4 (2010): 417-36. 3. Rittenauer, M., L. Kolesnik, M. Gastl, and T. Becker. “From Native Malt to Pure Starch – Development and Characterization of a Purification Procedure for Modified Starch.” Food Hydrocolloids 56 (2016): 50-57. 4. Patel, B.k., R.d. Waniska, and K. Seetharaman. “Impact of Different Baking Processes on Bread Firmness and Starch Properties in Breadcrumb.”Journal of Cereal Science 42.2 (2005): 173-84. 5. Kim, Sanghoon, Atanu Biswas, Mukti Singh, Steven C. Peterson, and Sean Liu. “Thermal Dissolution of Maize Starches in Aqueous Medium.”Journal of Cereal Science 56.3 (2012): 720-25.